ACTS made at a Parliament begun and holden at Westm. the Second Day of April, Anno Primo Regine Marie, and there continued and kept until the Fifth Day of May then next following, Anno dicto. AN Act, declaring the Regal Power of this Realm to be in the Queen's Highness, as fully and absolutely as ever it was in any of Her most Noble Progenitors, Kings of this Realm. An Act, touching the Articles of the Queen's Highness's most Noble Marriage. An Act, ratifying and confirming the State of Dame Lucye Clifforde, in the Manor of Burston Haughe. 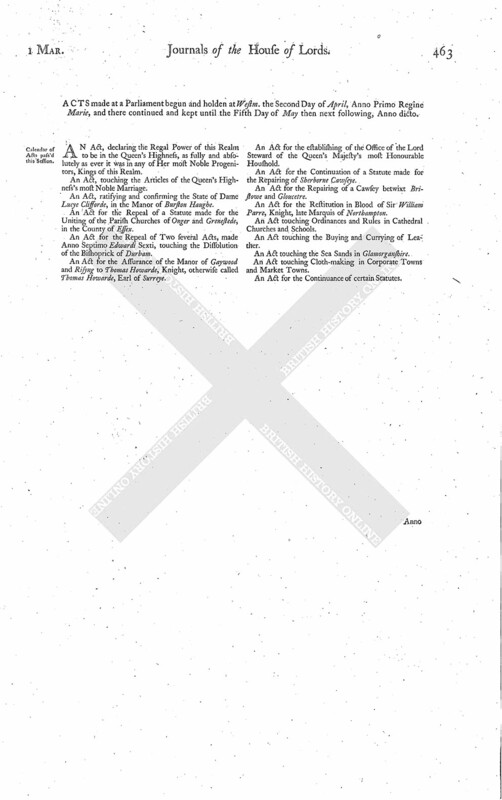 An Act for the Repeal of a Statute made for the Uniting of the Parish Churches of Onger and Grenestede, in the County of Essex. An Act for the Repeal of Two several Acts, made Anno Septimo Edwardi Sexti, touching the Dissolution of the Bishoprick of Durham. An Act for the Assurance of the Manor of Gaywood and Risyng to Thomas Howarde, Knight, otherwise called Thomas Howarde, Earl of Surreye. An Act for the establishing of the Office of the Lord Steward of the Queen's Majesty's most Honourable Household. An Act for the Continuation of a Statute made for the Repairing of Sherborne Cawseye. An Act for the Repairing of a Cawsey betwixt Bristowe and Gloucetre. An Act for the Restitution in Blood of Sir William Parre, Knight, late Marquis of Northampton. An Act touching Ordinances and Rules in Cathedral Churches and Schools. An Act touching the Buying and Currying of Leather. An Act touching the Sea Sands in Glamorganshire. An Act touching Cloth-making in Corporate Towns and Market Towns.